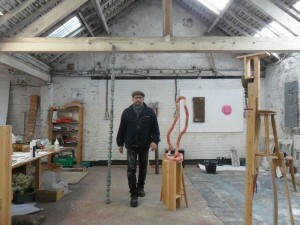 Lewis Robinson has been making sculpture and drawings for over three decades. This website represents a small sample of that work. After some early explorations working as a wood carver and then modelling with clay, firing and casting, he eventually found his path in the construction and piecing together of fragments and remnants which appealed to his love of improvisation and the unpredictable. His interests lie in examining the domestic landscape as a journey both physically and psychologically, reinventing the ordinary and everyday. This has been an underpinning theme over many years and continues to fascinate his curiosity for the strangely familiar. His own domestic situation and geographical location has had its part in shaping the work he has made. Increasingly, the found object has been appropriated in his work providing the starting point for a reconstruction. The work he then makes, reflect on their original appearance and re-present themselves as robust and sometimes fragile structures offering new meanings, chains of signification and reflections on life. Coupled with this is a continuing fascination for rethinking the sculptural object as a silent and eloquent expression of being in the world. Home can sometimes appear transient and elusive. Paradoxically, home suggests familiarity, comfort and security and yet it can be a theatre for the absurd, strange and bizarre. Is it a state of mind or a place? His works reflect that uncertainty but also point to the fact that things can be rebuilt but not always in the way we would expect. We live in a culture where DIY is cool and the DIY stores reign like cathedrals to the flat-pack. The home and its furnishings are substituting our identities which can be discarded, disguised and remade. Photo Credits the artist, Paul Sudlow and Ikuko Tsuchiya.